We are excited to introduce you to this 2 pack set of the Schiipper Ultimate Stainless Steel 12 oz. Stemless Wine Glasses. We\'ve taken your favorite stainless steel stemless glasses and given them benefits. The innovative Schiipper stainless steel mugs have a specially sealed lid with a sliding opening so you can keep the lid in place at all times and only open that little opening to drink. 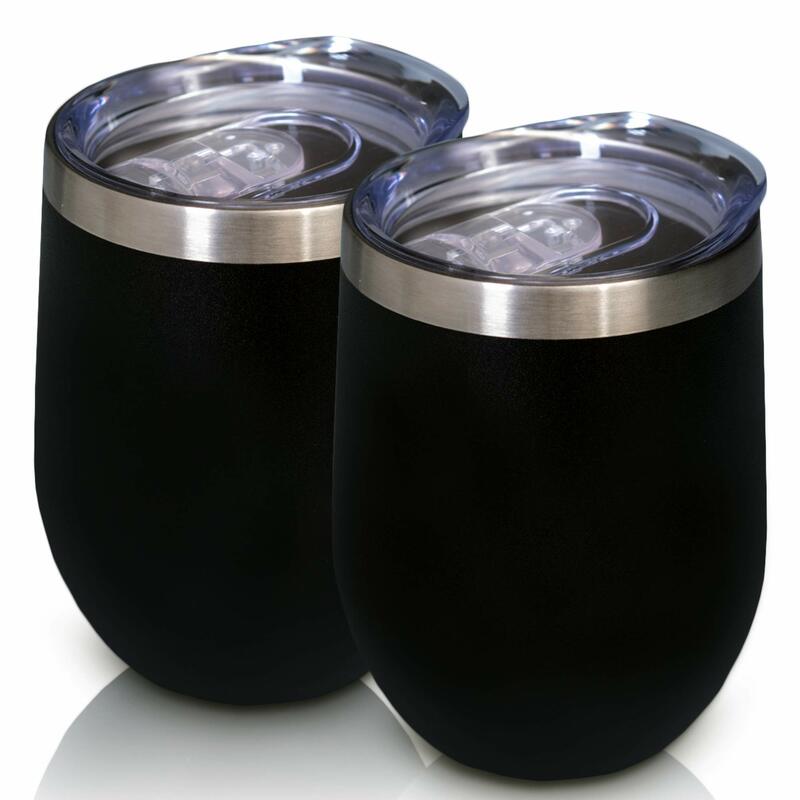 The special double wall insulation with copper lining does its job really well and with the added protection of the closed lid - your drinks will stay at the perfect temperature for double the time. Made with a black powder lining on the outside these cups are outstandingly attractive and can be used for intimate times together or for great dinner parties. Use indoors or out, the fact that they are virtually indestructible means you get to take them anywhere and they will always come back as good as new. Wash on the top shelf of the dishwasher or with warm water and detergent. Couldn\'t be easier! Together with the important and fun bonuses we provide, this really is the perfect answer to all your beverage requirements. You receive, 2 stainless steel straws with their own cleaning brush plus 2 additional lid sealers for your total confidence! Once you have these mugs you will never look back! This is outstanding elegance matched with complete practicality. What could be better. Get yours now and avoid the Christmas rush! There is absolutely no risk with this purchase. If you are not 100% thrilled, simply return within 30 days for a FULL REFUND.